One pair of Gloves. Select your size. 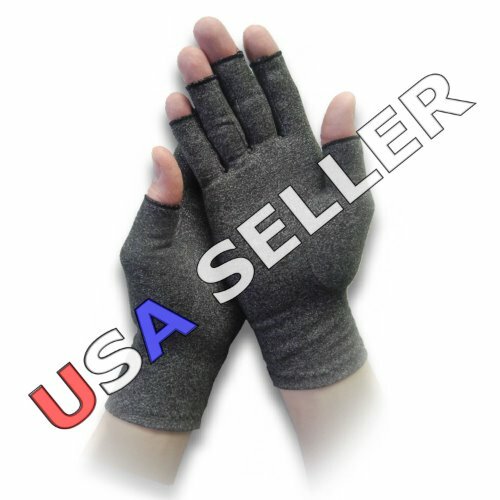 These gloves provide mild compression which can help increase circulation while relieving swelling, stiffness and minor aches and pains associated with arthritis, edema, poor circulation, cold hands or hand fatigue. Made from a soft, breathable cotton and spandex blend. Comfortable enough to wear all night and day. Open fingertips give you freedom to feel, touch and grip. XS = 2.25" to 2.5"
S = 2.5" to 2.875"
M = 2.875" to 3.125"
L = 3.125" to 3.5"
XL = 3.5" to 3.75"